Yelm’s SRO raises their already-high bar with The Lion in Winter! WHEN: March 8-31, Friday & Saturday nights at 7:30pm, Sunday matinees at 3pm (includes post-show History Chats – March 10, 17, 24). TICKETS: $20 Regular price, $17 Military (and families) & Seniors, $10 Students. Click here to pre-purchase tickets online and to read the plot summary. A Review In arriving at The Triad, I was pondering the enormity of Standing Room Only (SRO) to take on this script and how this would translate to the theater’s small stage. After-all, my only previous exposure to the play was the movie adaptation from 1968 starring Peter O’Toole and Katherine Hepburn. I left The Triad amazed at how professional SRO pulled-off such an ambitious project. The Cast and Director received my standing ovation, deservedly so. Well-known actors to Yelm audiences shined and delighted once again: Dave Champagne, Jesse Geray, Daniel Wyman, and Will Champagne. However, these fine thespians all stretched themselves to deliver greater performances than I’ve seen on this stage from them, revealing even more depth in their respective acting ranges. In doing so, the synergy they created, much from body motions, facial expressions, and intonations in their lines delivery, was very important to the success of this show. They made the insolence of their characters really felt by the audience. Will Champagne’s performance was stellar and is to be commended for holding his own with the others, especially in scenes with his father, Dave. They commanded The Triad’s stage taken to greater heights! Dawn Wadsworth and Travis Martinez returned to SRO’s stage for their second time and were joined by first-timer here, Victoria Ashley. They were paramount in their roles allowing them to seamlessly engage with our seasoned Yelm-stage actors. Dawn was especially amazing in an exceptionally demanding role. I hope to see more performances from these three fine actors in future SRO shows. The other stand-outs in this production were the outstanding direction of Angela Marinella and the fab work by Stage Manager Alex Brown and his team, as there were many intricate set changes which were carried-off with precision. The gorgeous costumes were also noted. 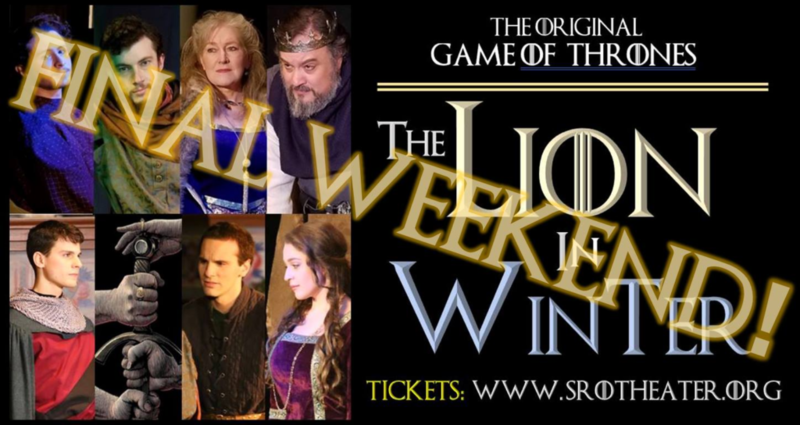 I congratulate SRO and The Lion in Winter team. They hit a home-run “outta da ballpark” which I hope is supported by patrons from far and wide, as they will be dazzled by this production! As a side note, I appreciated Dave Champagne’s comment in the program about his mission to provide a lasting legacy to the 2 decades of hard work by SRO founder Nancy Tribush Hillman and the numerous theater volunteers all of those years. Bravo Dave – you’re a true “mensch”!